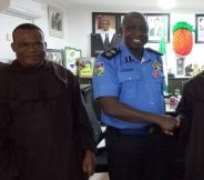 Two Catholic Priests who were kidnapped on Christmas Eve, December 24, 2018 have been rescued, police in Southeastern state of Anambra have announced. . In a statement on Friday the state’s police command said the priests were rescued in joint operation with other sister agencies. The Anambra State Police Command wishes to inform the Public that yesterday 27/12/2018 following a joint operation with other Sister Agencies in the State successfully rescued two Catholic priests earlier kidnapped on 24th December 2018. 2. Police special teams comprising of FSARS, PMF, Counterterrorism, Special Anti Cults units in conjunction with other Sister agencies and the Vigilante group had mounted an intensive search and rescue operations for the priests since the incident took place and with the aid of a Modern technology and aerial Surveillance due to difficult terrain, the abductors were forced to abandon their victims at about 6:45 pm of 27/12/2018. 3. The Victims, Rev Fr Peter Nwachukwu, parish priest of St Theresa's Parish Umueze-Anam and Rev Fr Cajetan Apeh who is the Assistant priest are now in stable condition and have since reunited with their families. 4. It is worthy to note that the safety of the victims is the ultimate priority of the Police in this situation. Consequently, the effort is being intensified to apprehend perpetrators of this heinous crime in order to bring them to Justice. 5. Meanwhile, the Commissioner of Police CP Garba Baba Umar hereby reassures Ndi Anambra of their safety during the yuletide period and beyond. The CP further warn all Criminal elements that Anambra is not a place to operate as they will surely meet their Waterloo and be dealt with decisively in accordance with the Law. SP Haruna Mohammed PPRO Anambra State Police Command.